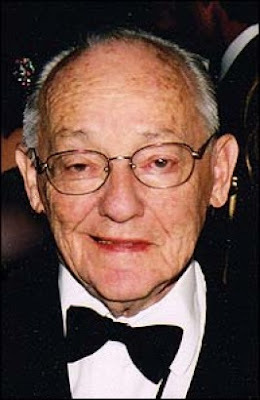 Broadway In Chicago and the Broadway community mourn the loss of Chairman of the Nederlander Organization, theatre owner/operator, producer and presenter James M. Nederlander, who passed away on July 25 at age 94 by honoring the Broadway tradition of dimming the marquee lights. James M. Nederlander, “Jimmy,” was a visionary theatrical impresario who built one of the largest private live entertainment companies in the world that now encompasses venue ownership and management, theatrical producing and concert presentation, merchandising, concessions and patron services, including Broadway In Chicago. Theatres dimming their lights in honor of James M. Nederlander include Broadway In Chicago’s Oriental Theatre (24 W. Randolph), Cadillac Palace Theatre (151 W. Randolph), The PrivateBank Theatre (18 W. Monroe) and the Broadway Playhouse at Water Tower Place (175 E. Chestnut). In addition, the League of Chicago Theatres will be inviting all other theatres in Chicago to join with the Nederlander venues in Chicago, on Broadway, in the West End, and in cities across the country who will all be dimming their lights on Wednesday, August 3, 2016. Lights will be dimmed for one minute prior to show time - in Chicago at 7:15 PM CT, prior to The Book of Mormon and Disney's Newsies performances and appropriate to show times for all other theatres around the world. “Jimmy Nederlander’s name has been synonymous with quality theatrical productions in New York City, Chicago and throughout the United States during his career, and in recent years his name has also come to symbolize excellence and achievement when “The Jimmy™ Award” is presented annually at the National High School Musical Theatre Awards, a tribute to his passion for arts education, his legacy will help to inspire the next generation of performers and enthusiasts,” said Charlotte St. Martin, President of the Broadway League. “Beloved by the industry, Jimmy was a loyal and trusted collaborator and a guiding mentor to so many. He was “one of a kind” and his indomitable spirit lives on throughout this country in the people he nurtured who are helping to make Broadway what it has become today. He will be sorely missed, and our thoughts are with his family and friends.” In Illinois, The Jimmy's regional competition is Broadway In Chicago's Illinois High School Musical Theatre Awards. During a career that spans 70 years, he has amassed a network of premier legitimate theatres including nine on Broadway: the Brooks Atkinson, Gershwin, Lunt-Fontanne, Marquis, Minskoff, Nederlander, Neil Simon, Richard Rodgers, and the world-renowned Palace; in Chicago: The PrivateBank Theatre, Broadway Playhouse, Cadillac Palace and Oriental Theatre; in Los Angeles, the magnificent Pantages Theatre; and in London, the Adelphi, Aldwych, and Dominion Theatres. He has produced over one hundred of the most acclaimed Broadway musicals and plays including Annie, Applause, La Cage aux Folles, Me and My Girl, Nine, Noises Off, Peter Pan, Sweet Charity, The Will Rogers Follies, Woman of the Year, and many more. Mr. Nederlander’s name is forever linked to some of the world’s most distinguished performing companies whose work he produced and presented on Broadway including the Royal Shakespeare Company’s acclaimed productions of The Life and Adventures of Nicholas Nickleby, Les Liaisons Dangereuses, Cyrano and Sherlock Holmes; Rudolf Nureyev and Friends, The Bolshoi Ballet, and the Virsky’s Ukranian State Dance Company. He is credited with developing the outdoor amphitheatre concept as the developer of several premier venues including the New Jersey Garden State Arts Center, Pine Knob Music Theatre, the Merriweather Post Pavilion, the Pacific Amphitheatre, and as the decades-long operator of the Greek Theatre where he has presented headline artists including Tony Bennett, Judy Garland, Lena Horne, Jackie Mason, Liza Minnelli, Frank Sinatra, Andy Williams, and a legion of others. In 1972, Mr. Nederlander and his pals Earl Blackwell, Gerard Oestricher and Arnold Weissberg founded the Theatre Hall of Fame, which is still housed in the lobby of the Gershwin Theatre. In 1973, he partnered with George Steinbrenner to purchase the New York Yankee Baseball Club. Mr. Nederlander is the recipient of many distinguished honors including the United Nations Foundation Champion Award (2012), The Broadway League’s Schoenfeld Vision for Arts Education Award (2010), the New York Pop’s Man of the Year (2008), the Special Tony Award® for Lifetime Achievement (2004), The Actors’ Fund Medal of Honor (2002), The Broadway League’s Distinguished Lifetime Service Award (2002), United Jewish Appeal-New York Federations’ Bernard B. Jacobs Excellence in the Theatre Award (1997) and the Hollywood Chamber of Commerce Star on the Hollywood Walk of Fame, located outside the Pantages Theatre at 6233 Hollywood Blvd. In 2009, the National High School Musical Theatre Award was established and named the Jimmy® to celebrate his career-long dedication to supporting young talent. He received an Honorary Doctorate of Fine Arts at the forty-third Commencement exercises at The University of Connecticut School of Medicine, School of Dental Medicine and Graduate School on Monday, May 12, 2014. Mr. Nederlander is survived by his wife Charlene S. Nederlander, his son James L. Nederlander and daughter-in-law Margo M. Nederlander, his grandchildren James M. Nederlander II and Kathleen M. Nederlander, his stepdaughter Kristina Gustafson and her children Gunnar Gustafson and Krisanna Gustafson. Broadway In Chicago was created in July 2000 and over the past 16 years has grown to be one of the largest commercial touring homes in the country. A Nederlander Presentation, Broadway In Chicago lights up the Chicago Theater District entertaining well up to 1.7 million people annually in five theatres. Broadway In Chicago presents a full range of entertainment, including musicals and plays, on the stages of five of the finest theatres in Chicago’s Loop including The PrivateBank Theatre, Oriental Theatre, Cadillac Palace Theatre, and just off the Magnificent Mile, the Broadway Playhouse at Water Tower Place and presenting Broadway shows at The Auditorium Theatre of Roosevelt University.